Looking for that perfect fishing decal for your boat, car or other extreme vehicle? Get your hands on a weatherproof vinyl decal by Tangling with Catfish™. 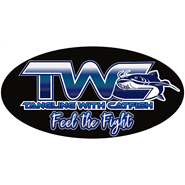 Our TWC™ vinyl decals come in a variety of colors and are great for any catfish enthusiast. All of our decals sport our TWC™ logo to remind you of your time out on the water tangling with giant channel cats, monster blues and trophy flatheads. Feel the fight™! Show off your love for catfishing today! Cuffed Knit Beanie Caps by Tangling With Catfish come in a variety of colors and are great for any catfish enthusiast. All of our catfish beanies sport our TWC logo in front and “Feel the Fight” in back, and help you stay warm while you’re out on the water hunting giant channels, monster blue cats and trophy flatheads. Wear and share your favorite sport with catfish beanie caps from Tangling with Catfish! At TWC™, we believe every giant channel catfish, monster blue cat and trophy flathead deserves to fight another day. 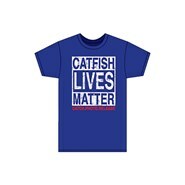 Get your “Catfish Lives Matter” t-shirt if you’re on board with catch-and-release fishing. Whether you are looking for catfish gear for yourself or for a loved one, Tangling with Catfish™ t-shirts are always a great buy. 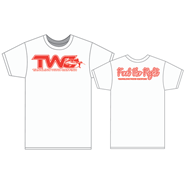 Each of our catfish t-shirts sports our TWC™ logo and “Feel the Fight™” slogan to remind you of your time outdoors tangling with giant channels, monster blue cats and trophy flatheads! Whether you are out on the water or out on the town, wear and share your favorite sport with catfish t-shirts from Tangling with Catfish™. 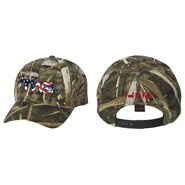 Flex fit hats by Tangling With Catfish™ come in a variety of colors and are great for any catfish enthusiast. All of our flex fit catfish hats sport our TWC™ logo in front and “Feel the Fight” on the back. There’s also a breathable mesh in back so you stay cool while you’re out on the water hunting giant channels, monster blue cats and trophy flatheads. Wear and share your favorite sport with TWC™ hats from Tangling with Catfish™! For all our female anglers out there, Tangling With Catfish™offers stylish pink and white cotton twill catfish hats with an adjustable buckle on the back for that perfect fit! All of our cotton twill catfish hats sport our TWC™ logo in front and “Feel the Fight” in back to remind you of your time out on the water fishing for large channel catfish, blue cats and giant flatheads with your friends and family. Wear and share your favorite sport with catfish hats from Tangling with Catfish™! Whether you are looking for catfish gear for yourself or for a loved one, snap back trucker hats by Tangling With Catfish™ are always a good purchase. Our snap back trucker catfish hats feature our TWC™ logo in front and “Feel the Fight” in back, and come in a variety of colors. 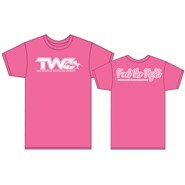 They are sure to remind you of your time outdoors tangling with giant channels, monster blue cats and trophy flatheads! Whether you are out on the water or out on the town, wear and share your favorite sport with catfish hats from Tangling with Catfish™. 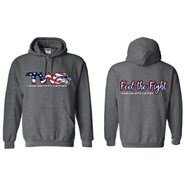 7.75 oz, 50/50 cotten/polyester Pill-resistant and softer air-jet spun yarn Double-linded hood with matching drawstring, 1x1 athletic rib knit cuffs and waistband with Spandex Double-needle stitching throughout Front pouch pocket.